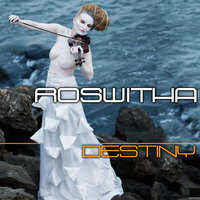 “I’m very vulnerable on this album,” says violinist, producer, and singer-songwriter Roswitha. “I want to create a shift from negative to empowering messages and inspire people to live their dreams because I know how much strength it takes.” On her latest album, Destiny, the renowned jazz and classical artist lives her own dreams, making the bold move to step out as a singer-songwriter. Here, she embraces her total musicality and tastefully integrates her instrumental virtuosity within a musical style Roswitha started to describe as Jazz Rock Pop. It’s an elegantly eclectic blend of jazz, classical, R&B, hip-hop, rock and pop that showcases her gorgeous compositions and soulfully angelic vocals. Previously, Roswitha has had an esteemed career as “Queen Rose,” a topflight violinist. She has appeared on Late Night with Conan O’Brien, in the movie August Rush, at the Latin Grammy’s, and was featured on MTV’s Unplugged with Trey Songz. As a member of the Philharmonic Orchestra of the Americas, she has performed with the likes of John Legend, Santana, Gloria Estefan and Patti LaBelle. Under the name “Rose Bartu,” she’s also built a highly respected jazz profile sharing stages with such icons as Abbey Lincoln, Billy Hart, Joanne Brackeen and Butch Morris and issued the delightfully exotic Cherchez la Verité, a silky jazz album with violin, sensual vocals, and limber Afro Cuban grooves. She lead her own bands performing at celebrated venues like The Blue Note, Knitting Factory and touring Europe. She has notched over 50 production, arrangement, composition and performance credits on over 19 released albums, videos and film soundtracks. Though the album has garnered favorable comparisons to such diverse artists as Sia, Sade, Florence and the Machine, Amy Winehouse, Adele, Tracy Chapman, Stevie Nicks, Les Nubians, Zap Mama and Björk, it‘s purely Roswitha. She organically inhabits a broad array of styles, tying them together with her euphoric and liberating message. “The general theme is live your dreams; free yourself from any external influences and seek answers from within,” she explains. Roswitha was reared in a rural Austrian home surrounded by music in the middle of the Alps with her parents and five siblings. As a little girl she tinkered with any instrument she could get her hands on, whether it was a recorder, guitar or piano. Ultimately, the violin became her preferred, primary instrument and, by age 13, she began performing professionally and nurturing a dream of touring the world with her music. By 14, she moved out of her parents’ home and began her classical violin studies at the University for Music and Drama Graz/Austria while attending the Performing Arts High School Dreihackengasse. Later on, she fell in love with New York City. Winning the prestigious Rotary Ambassadorial Scholarship “to further international understanding and friendly relations among people of different countries and geographical areas,” allowed her to live her dream to study in the Big Apple. Roswitha holds bachelors of fine arts degrees from the world-class, cutting-edge New School University Jazz Program, NYC, and Anton Bruckner Private University for Music, Drama and Dance, Linz, Austria. Currently, manages a robust performing and recording schedule and is also an Adjunct Performer in The Hip-Hop Dance Conservatory Repertory Company, NYC.